Wine and food lovers united at the second annual Rioja Wine and Tapas Festival which took over Union Station on Saturday, May 2nd with almost 200 wines and tapas from 30 chefs around the country. The Rioja Wine and Tapas Festival was a way for people to explore and enjoy Spain’s most renowned wine region of the world, well known for its quality. “With the tremendous success of last year’s Rioja Wine and Tapas Festival , we are thrilled to bring the flavor of Rioja to the Windy City,” said Luis Alberto Lecea, president of Rioja DOCa. “Chicago is an amazing food town that honors Rioja with countless restaurant and retail offerings, so it makes sense to bring our Tapas Festival to such a lively market.” Located in north central Spain, Rioja is considered one of the greatest red wine regions in the world. 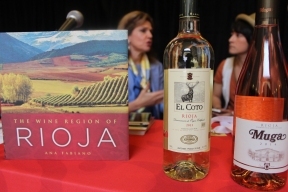 If you would like to learn more about Rioja Wine and Tapas Festival, visit www.RiojaWine.com. © 1167 Chicago Hispanic Newspaper, Lawndale News, Hispanic Bilingual Newspapers, Su Noticiero Bilingue. All rights reserved. XHTML / CSS Valid.